I am not afraid to voice my displeasure with Venomverse #1 in the same way I'm not afraid to pleasure myself all over Venomverse #2. Cullen Bunn provides a much clearer vision for this book that smartly starts off with a badass poison Spider-Man vs. Venom battle. Not only does it actively engage the reader with an intense showdown, but it provides a meaningful introduction to poison Deadpool, Mary Jane and Old Man Venom. It's a neat fight with even more neat visuals of the three new poison characters. 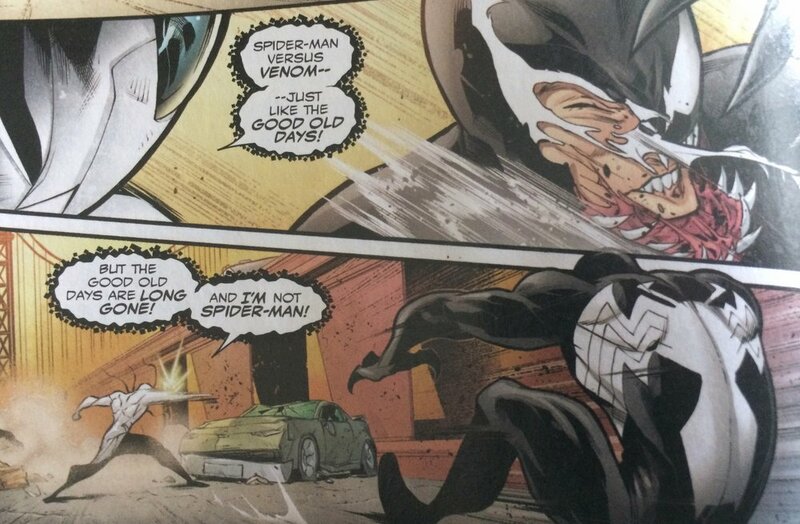 It's awesome to see these characters get the Venom makeover, and equally awesome that it's starting to make sense as much as it ever could. At the end of the first issue, we're left to believe that Venom Captain America is dead and that Spider-Man has been taken over by the mysterious and powerful poison that is turning those infected with the symbiote into more terrifying and evil versions of themselves. That leads us right up to the introduction fight in #2, and a look at the imprisoned Captain America. We finally get a taste of just how evil these poison characters are when we see Cap persuaded by poison Sharon, and eventually who is the mastermind behind it all. It takes it to another level and makes me excited to check out #3 to see where this is going, because I truly have no idea. Bunn showed off his prowess in this issue, and man, that's a satisfying read when he's clicking with a clear vision. As for the art, Iban Coello and Matt Yackey on colors do a great job with creating alternate versions of some of the most beloved characters Marvel has to offer. The poison-infected heroes are fantastic (especially one of their new troops), and the symbiote-infected ones are just as cool -- specifically Wolverine and Rocket Raccoon. While this is fun, Bunn took it to the next level by adding in the MJ-Spider-Man factor and Sharon-Cap factor. There are some serious mind fucks being done in this issue to paint this dark and twisted world in the way the first issue didn't. Rating: 8/10 hits to my nostalgia bits, Cullen Bunn gets this book on track with a clearer focus and use of the innovative designs of the infected Marvel characters. Great work from Iban Coello and Matt Yackey, as well, but Bunn made this an extremely satisfying read that was leaps and bounds better than the first.